Just came back from a training and we had oatly chocolate in the fridge, it is SO. DELICIOUS. 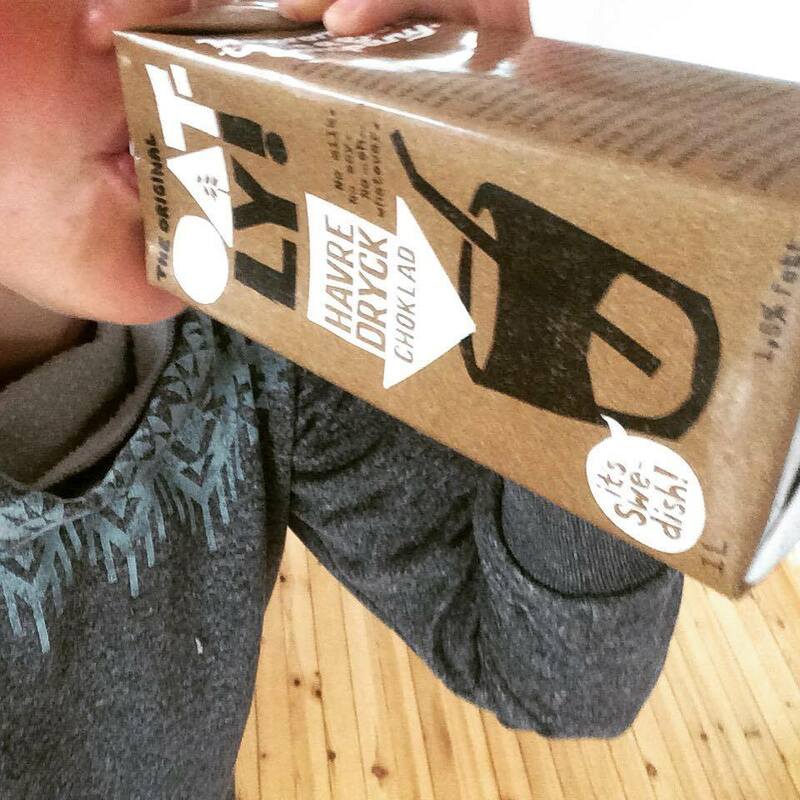 As the foodie and wannabe environmentalist I am I started to research the life cycle analysis of this oatly drink and I wanted to compare this with soy and cow milk. A lifecycle analysis has the whole chain from the first step of producing oat/soy seed/ baby cow to when the product is on it´s way to recycle. So it includes everything that you want to measure. F.ex. Carbon dioxide, sulfur dioxide, methane, nitrogen oxides etc. I will not write a scientific paper on this but to give you the answer form these studies, the environmental impact seems to be less in the process of producing oat milk than cow milk. My journey through the “awareness” of my nutrition and its impact on the planet started when I was 14 and decided to stop eat meat. I was convinced it was the better for the planet. Taking some more classes of biology and nature science at high school (and I guess also impact form my social circle) I started to eat local meet or wild meat like reindeer or moose that someone nearby had hunted. Getting into university it made me vegetarian again due to my economical situation, lentils, oats and rice was the base of my nutrition for many years. Traveling and having a lifestyle that takes you through different cultures I started to eat meat again, not much, but I didn’t say no when someone offered me a piece of chicken or cow. I wanted to be polite and easygoing. And I didn´t mind the taste. I sometimes actually could want to eat meat. 1,5 year ago I stopped, mainly because I started to think more and more of the whole process of meat, the process of producing the animals food, and how we handle the animals. Is it worthy? I didn’t want to eat meat that was treated that way, or had that impact on nature. I had no problem with meat that friends hunted or meat from the neighbour farm that the animals kept the landscape open, could run free and seemed to have a quit happy life. But I didn´t eat it anyway. Living in the north with the big areas of pasture, grazing land and forest we have all the opportunities to be self-sufficient with food. What we don´t have is the warm temperatures to grow lentils and beans with higher amount of protein. Which is one of the main reasons I have not (yet?!?) convinced myself to stop eating milk and eggs as it´s a good source of protein. I do think at least up here where the areals are so big, that having animals and the protein source we get from them is logical and sustainable. But I don´t think, and studies are showing that, the areas here can not handle the average meat consumption of today. I have not read any study about the impact from transporting tons of dried lentils and beans on a boat from the south to here. But it´s hard to believe it has a very big impact. And by the way isn’t it crazy that it can be cheaper to buy a piece of cow from Argentina than from the local farm? Anyway getting back to the milk, that started all this writing, I am such a big lover of cow milk in coffee. I drink around 0,7 liter /week and maybe 200-300 grams of other milk products. I eat and drink this ceremoniously. I find it to hard to stop with that but I´m very happy that there´s products that can be like a substitute for milk products. Yoghurt, ice cream and chocolate milk from oatly or other brands are more tasty than the cow milk based, at least when I think about the whole chain. So I try to eat local, seasonal and organic. This is also an issue of money, like I mentioned before, when I was a student my diet was mainly lentils and rice and oats. I try to get my protein mainly form lentils and beans but I do eat some cow milk products and eggs because it´s easy protein. I appreciate the convenience of today, having products shipped all over the world. Like coffee, coconuts, peanuts, banana, avocado, cacao oh the list is long..which are the products I enjoy the most and I think about this a lot when I eat them, bake with them or just buy them. I don´t write this to say you should do this or that, I just write this to share my thoughts of nutrition and why I eat like I do. And I got the inspiration to write when I drank the oat chocolate drink. Do you have any of these thoughts? Any reflections? I think this is super interesting to hear from you! Such good thoughts Emelie. I too am wondering what, in my eyes and with the amount of informations I have, is the ”right” way to eat. I am vegetarian and eat some organic eggs and a bit of milk and cheese. Not much, I even stopped for a while and then realised that the substitutes were just as bad or even worst for the environment. Even if I care a lot, there are many factors that do not match together in my behaviour (not eating meat but buckwheat from China and 3 avocados a week for example). Also worth considering is the economical impact of export like cocoa, bananas, mangoes, pineapples in countries that are producing these products. Whenever possible I try to choose dry products that can be transported by boat and not plane. And local and seasonal products as much as possible – but living in Switzerland, here we cannot produce enough organic food for our population, so we have to import. Maybe we should start looking at a continents scale, and choose products that are brought by train and boat. ”Eating animals” is a book by Jonathan Foer that you probably already know, but if not, it might be worth having a look at it! One last thing: clothing has a huge impact on the environment as well. Linen grows organically in france for example and does not need much water – unlike cotton that travels thousands of km and need pesticides and hundreds of litres of water. I guess the solution is everywhere, step by step, small changes in our daily habits will lead to a better norm! Thanks for the great articles, daily inspiration&motivation Emelie!! Well, I’d like to thank you first for all your inspiring articles / thoughts Emelie !! Nutrition and the food environmental impact is such an interesting topic and very complicated if we listen to all the différent opinions. I myself try to have my own vision about all this and became also almost vegetarian (as you in the past, if someone invites me over diner and there is meat I don’t refuse to be easy going). For the protein, it’s the same you can find tones of protein in almonds, nuts, sprouted seeds… more than in meat ! It’s fascinating. Anyway, I think the most important is the awareness of the food we put in our plates and try to do some efforts step by step to improve the global food system of our world ! vegetarian around 1 year ago. My family thought I had gone crazy / was having a crisis, especially with the increase in time I spend running and the general tradition of eating ‘anything that moves’. To me though it made perfect sense. I totally don’t believe it’s necessary to kill animals to feed us, especially when people see how much protein is in everyday foods such as nuts, dairy (though you have got me thinking about oat milk, which I haven’t tried yet), bread, legumes and grains. That more than covers what even the most elite of athletes need to recover from their exertions, let alone the average human being. Also as a supporter of environmental protection and general lover of animals, it made no sense to continue eating meat or fish. While I find the idea of giving up cows’ milk (especially chocolate! and cheese!!) a bit extreme, I totally respect other people’s dietary choices, whether vegan, vegetarian or carnivore. It would be great to buy all local and seasonal products, but in some countries, as you touched on earlier, it costs more than importing from another country, and especially when money is tight, buying the cheaper produce is preferred, no matter where it comes from. I went vegetarian for 6 months and combined with lots of training and work load in my opinion you cannot replace animal based proteins with plant based proteins. I ended up losing so much weight, suffered from fatigue and other health issues. I would love to be vegetarian / vegan but from my personal experience we as humans need a small amount of meat in our diets. In future years when I’m doing less running and work I would try it again but I found the plant based proteins just didn’t have the same effect as animal based proteins when combined with modern day lifestyle / demands. This topic really interests me. As a yoga practitioner and teacher, I have experienced a huge difference in the lightness of my body and mind when in yoga teacher’s trainings or retreats, where diet is vegetarian. But the food there use to be very good and with all the nutrients someone needs. The real issue is when you go back home. I live in Spain and it’s supposed that we have sun and lots of vegetable products, and that’s true. But it’s not easy to find all the products you need to eat well, with all the nutrients, and even worse if you try to find them organic. It’s getting easier and cheaper, but it’s not enough. It’s expensive, and surprisingly sometimes it comes from abroad. And, of course, it’s more difficult with meat. As you said, when I go visit my family or friends I eat whatever they cook, I think it’s important to be flexible and keep your friendship (hehe). In my opinion the point is to buy and eat local, if possible organic, seasonal and flexible, depending on what your body demands (it changes through life) and feels good on you. I am a vegetarian and I find it really easy. What I find hard is giving up milk so I am really interested in Oatly. I have read that almond milk consumes a vast amount of water and I think oats might be a superior choice to it. If it weren’t for milk and the occassional sprinkle of some kinda parmasan cheese on my salad, I’d be vegan. I don’t use a vegan multivitamin but I think I need to. Its hard to get adequate D and B vitamins without some sort of supplementation. However as a whole I am not one to like taking pills. The soil in the US is depleted. It now does lack the concentration of phytochemicals that we need so much as plant-based eaters. I eat a huge cabbage everyday for lunch: red cabbage, carrots, sesame seeds, zuch, cucumber, cherry tomatoes and a vinagraite (homemade) of cider vinegar, 4 cloves of garlic – minced, soy sauce, honey. I make mine sweet. And this salad is as big or small as I need it to be. If I am hungry later in the day I eat more big fat carrots. I train quite a bit too. And drink a fair amount of coffee (okay probably too much but I love french pressed french roast day or night) and in my coffee I use sugar and lowfat milk. I love my milk. I just need to find an alternative. I agree with all of these! I went vegetarian about 10 months ago for environmental reasons. I try to minimize eating other dairy products (and don’t drink cow’s milk), and love baking and cooking vegan alternatives (and they’re usually healthier!). I play volleyball, rock climb, and have recently gotten into running (though I’m not that good yet). Everyone is always confounded how to get enough protein, but I still get more than I need without meat.